Auscultation is the act of listening to the sounds of internal organs. It is an effective non-invasive clinical tool to monitor the respiratory system. Since more than 200 years the stethoscope is used for auscultation. 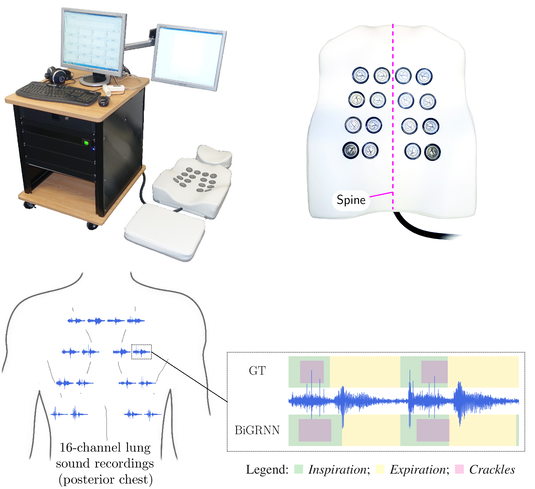 The inherent inter-listener variability and the recent technical advances yield to an increased interest in computer-aided lung sound research. and the classification of lung sounds with focus on deep neural networks. This research project is a cooperation with the Division of Thoracic and Hyperbaric Surgery of the Medical University of Graz. The upper left figure shows our multi-channel lung sound recording system. The upper right figure shows the developed 16-channel electronic stethoscope, realized as a foam pad with several lung sound transducers. The lower figure schematically illustrates recorded lung sounds over the posterior chest from a patient diagnosed with idiopathic pulmonary fibrosis (IPF). The enlarged recording contains the labeling of the temporal position of the three events crackle, inspiration, and expiration. The upper event roll represents the ground truth (GT) labeling and the lower one the automatically detected events with our developed algorithm (BiGRNN). Adventitious sounds caused by IPF are fine (or velcro) crackles during inspiration, heard over affected areas.